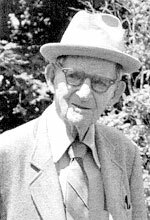 Nels Anderson arrived in Barclay (Clover Valley) early in July of 1908. He was taken in by the Woods family and went to school in Barclay through the 8th grade. He studied at the University of Chicago under Robert E. Park and Ernest Burgess, whose concentric zone theory was one of the earliest models developed to explain the organization of urban areas. He obtained his Masters degree in 1925 from the University of Chicago. Anderson received his doctorate from New York University in 1930 and was an instructor at Columbia University from 1928 to 1934. "The Hobo: The Sociology of the Homeless Man"
"The Milk and Honey Route A Handbook for Hobos"
"Desert Saints: The Mormon Frontier in Utah"
"The Urban Community: A World Perspective"
"Work and Leisure: A Perceptive Inquiry Into Current Ways of Using Time"
"Dimensions of Work: The Sociology of a Work Culture"
"The Industrial Urban Community: Historical and Comparative Perspectives"
"The American hobo: an autobiography"
"Nels Anderson's World War I Diary"
For the information page, click here.
" Hopeful Odyssey: Nels Anderson, Boy Hobo, Desert Saint, Wartime Diarist, Public Servant, Expatriot Sociologist"